The 91st Oscars were held on Sunday, February 24, 2019, at the Dolby Theatre at Hollywood & Highland Center in Hollywood, and was televised live by the ABC Television Network. The host-free program was also televised live in more than 225 countries and territories worldwide. Green Book, the story of the unlikely friendship between a bigoted bouncer and a virtuoso black musician, was named the best picture of the year. Roma won best director for Alfonso Cuaron adding to its win for foreign language feature Oscar and cinematographer. Rami Malek scored best actor for his chameleonic turn in Bohemian Rhapsody as Queen frontman Freddie Mercury. Olivia Colman nabbed best actress for her role as a mercurial monarch in The Favourite. Regina King won best supporting actress for her role as a fiercely protective mother in If Beale Street Could Talk. Green Book’s Mahershala Ali picked up his second Academy Award for best supporting actor. A Star is Born won best song for Lady Gaga’s anthemic Shallows. Spider-Man: Into the Spider-Verse earned the Oscar for Best Animated Feature. Read more HERE. To see a list of all of the Oscar nominees, please click HERE. 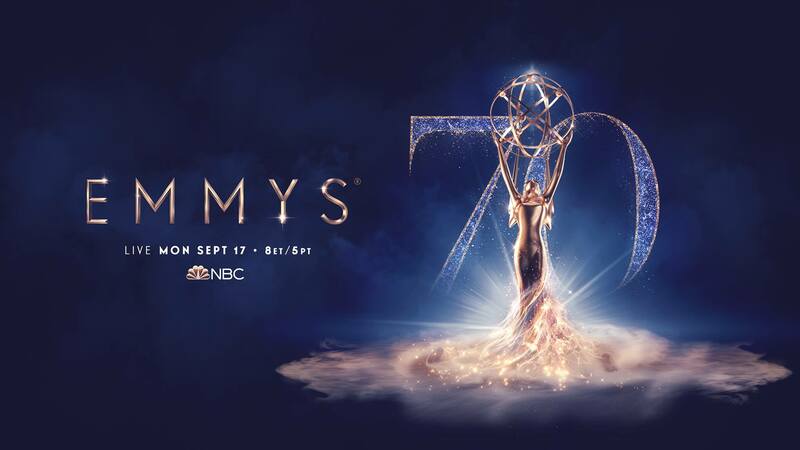 The Television Academy are set to announce the 70th Annual Emmy Awards winners at the Microsoft Theater in Los Angeles tonight and you can check the winner’s list HERE. King was praised by PEN, the literary and human rights organization, as an advocate for literacy and free expression. 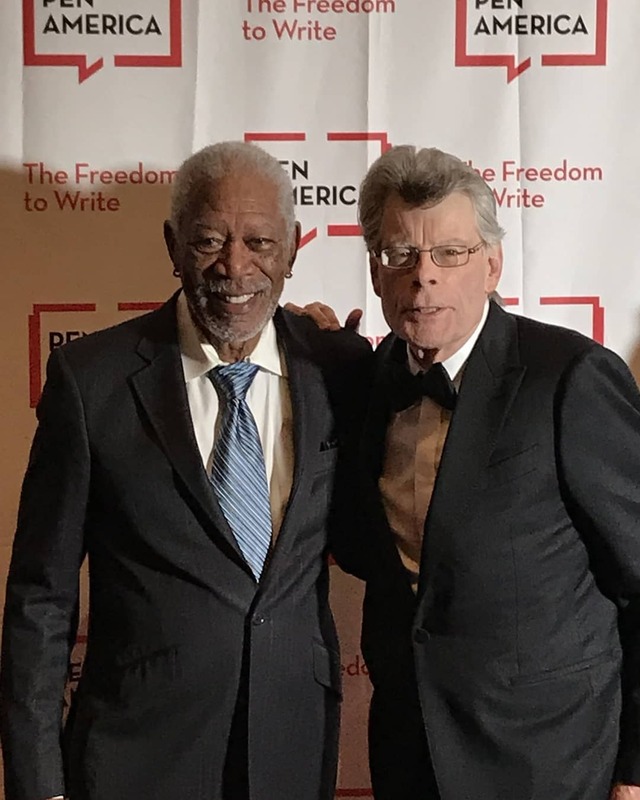 PEN’s annual fundraising gala was held at the American Museum of Natural History, where attendees included novelist Margaret Atwood, actors Michael Douglas and Catherine Zeta-Jones and Pulitzer Prize-winning novelist and PEN president Jennifer Egan. Guillermo del Toro’s The Shape of Water emerged victorious, winning a total of four Academy Awards, including Best Picture, Best Director for Guillermo del Toro, and awards for both original score and production design. Three Billboards Outside Ebbing, Missouri, was the standout in the acting categories, earning Frances McDormand an Oscar for Best Actress, and Sam Rockwell an award for Best Supporting Actor. Gary Oldman’s lead performance as Winston Churchill in Darkest Hour, and Allison Janney’s supporting turn in I, Tonya rounded out the acting categories. Jordan Peele won the Oscar for Best Original Screenplay for Get Out. Pixar’s Coco won Best Animated Feature Film. Christopher Nolan’s Dunkirk, which had earned 8 nominations had three wins in technical categories, including sound mixing, sound editing, and film editing. Blade Runner 2049 stood out for its pair of visuals-oriented wins, including Best Visual Effects and Best Cinematography, the latter of which earned legendary director of photography Roger Deakins his first Oscar win. See the full list of the 2018 Academy Award winners HERE. ABC and the Academy of Motion Picture Arts and Sciences announced that the 90th Oscars telecast on Sunday, March 4, 2018 will now begin at 8:00pm EST/5:00pm PST, a half hour earlier than the prior Oscars broadcast. As previously announced, late-night talk show favorite Jimmy Kimmel will return to host, and Michael De Luca and Jennifer Todd will return to produce. Additionally, starting at 6:30pm EST/3:30pm PST, the Oscars Pre-Show returns to give fans exclusive, insider access to all the excitement of the red carpet. The 90-minute special features interviews with nominees, presenters and performers, and brings viewers the best behind-the-scenes moments. The 90th Oscars will be held on Sunday, March 4, 2018 at the Dolby Theatre at Hollywood & Highland Center in Hollywood, and will be televised live on the ABC Television Network. Here is the full list of nominations for the 2017 Oscars. Every nominee, every category, every detail you need is right here. What was nominated for Best Picture? Which actors and actresses scored nominations in all the biggest categories? Which film received the most nominations? 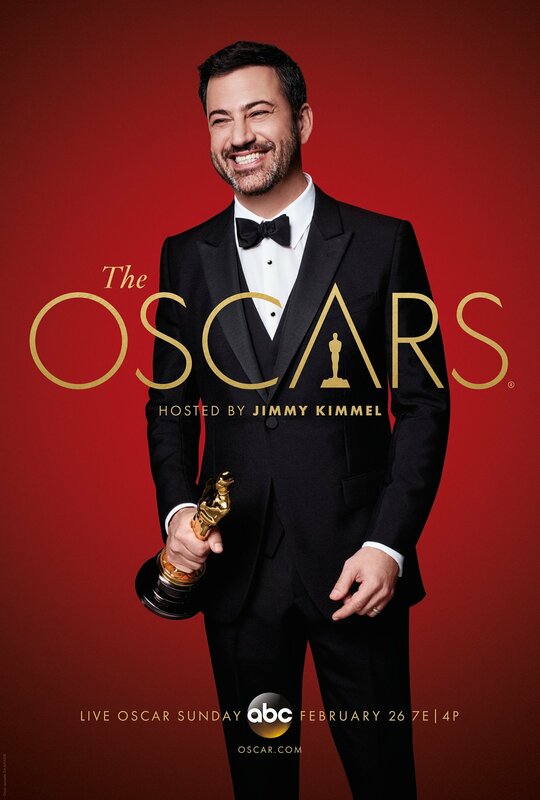 Watch The Oscars on Sunday February 26 7e|4p on ABC. 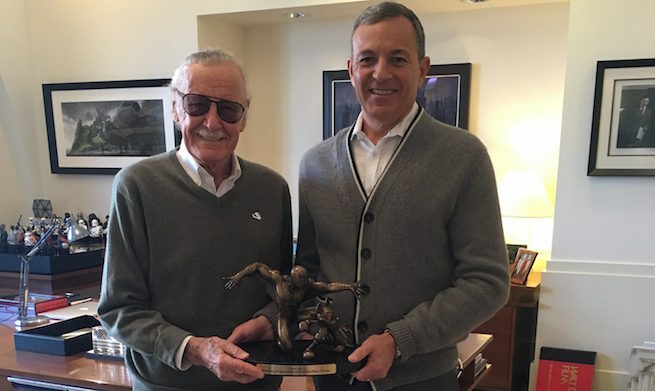 The Chairman of The Walt Disney Company, Bob Iger, recently presented Stan “The Man” Lee with a one-of-a-kind bronze statue to commemorate the legendary comic book writer’s 75-year career at Marvel. 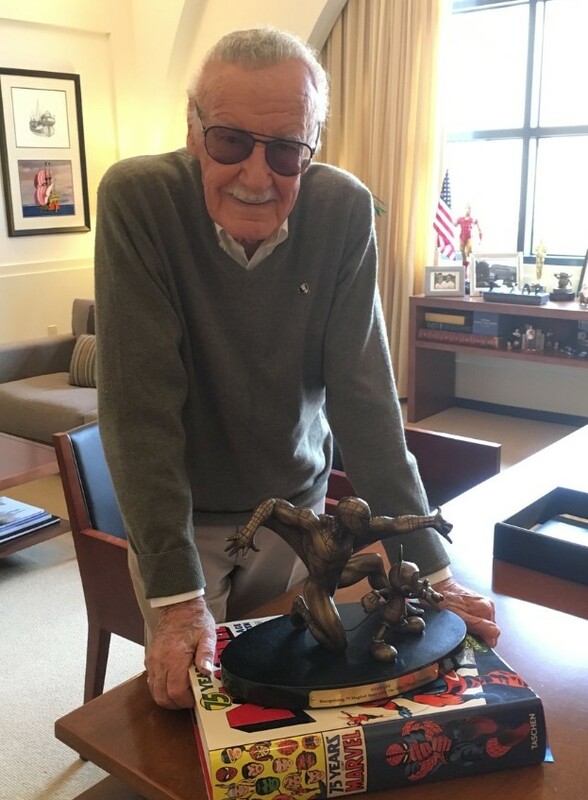 The bronze features Spider-Man, one of Lee’s most famous co-creations (in collaboration with Steve Ditko), alongside Mickey Mouse, a nod to Marvel’s acquisition by Disney in 2009. Since Disney’s purchase of Marvel, the two entities have found plenty of shared box-office success with record-setting films like “The Avengers,” “Iron Man 3” and “Captain America: Civil War.” Many of the characters in these Marvel Studios’ films were co-created by Lee, including Iron Man, Thor, the Hulk and Doctor Strange. Stan Lee has worked in the comics industry since he was a teenager, where he got his start as an assistant at Timely Comics in 1939. He is primarily known for his foundational work at Marvel, alongside artists Jacky Kirby and Steve Ditko. With these collaborators, he had a hand in creating the X-Men, Fantastic Four and other staples of Marvel’s IP stable. For his achievements, he received a National Medal of Arts in 2008, and was inducted into both the Will Eisner Award Hall of Fame in 1994 and the Jack Kirby Hall of Fame in 1995. There’s An Oscar Among These C-3POs. Can You Spot It? 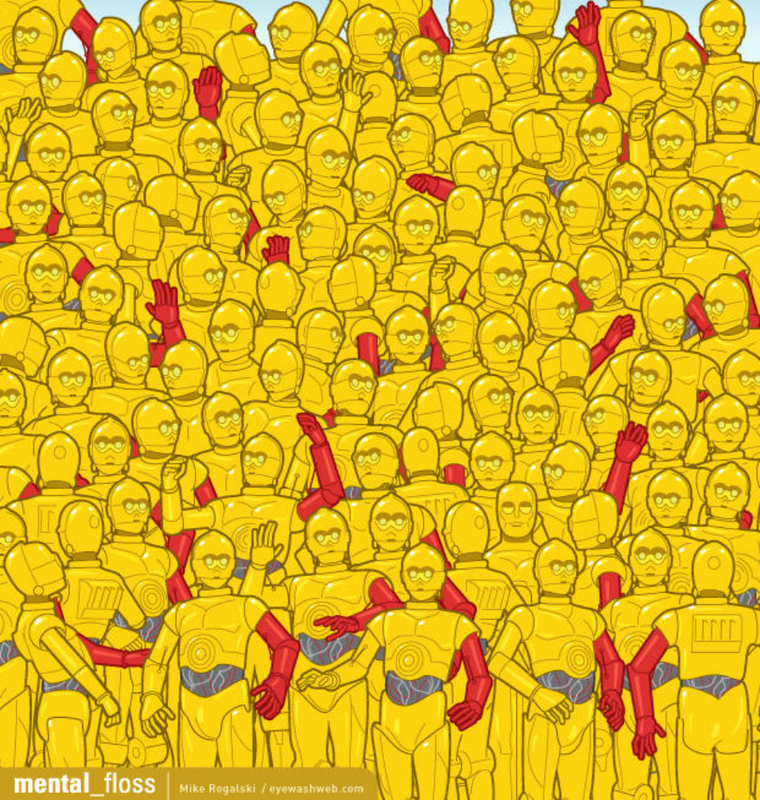 In honor of today’s Academy Awards ceremony, Mental Floss is sharing this Star Wars themed hidden picture. Illustrator Mike Rogalski has hidden an Oscar statuette amongst these C-3POs. May the Force be with you in finding it.